I thought the film Transcendence with Johnny Depp would be a good start form my new Transhuman Movies category because it is based on technology that some of the greatest thinkers and organizations (like DARPA and Google) are working on even as I type (Don’t believe me? Just have a look around Dawn of Giants and then tell me what you think.). This movie got terrible reviews, but I loved it. I only had one problem with the movie itself; the typical Hollywood ending. Do you really think a human, no matter how smart, would be able to write a virus that could stop a god-like, post-singularity consciousness? The idea is absurd, however I also understand how hard it would be to write a realistic ending for Transcendence because a post-biological entity would be intelligent past our current ability to understand. I remedied this little imaginative hiccup by actively suspending my disbelief (the same thing religious people subconsciously do in order to keep their faith*). Here’s my other problem and it’s actually not with the actual movie at all. I read several reviews for Transcendence and they all say something like “a cautionary tale” or I read one review which called the movie “Hollywood’s bizarre techno-idiocy” (the reviewer who wrote this is Andrew O’Hehir). While the latter is just technological ignorance** by someone who is obviously oblivious to what is going on in the tech world, the former just struck me as out of context. To whom is this a cautionary tale? Anyone who ‘transcends’ – especially if they have already mastered nanotechnology – would basically be untouchable by unaugmented humans. On the flip side, William Caster (played by Johnny Depp) was actually acting as a benefactor to humanity and what do us primitive, ape-people do? We attack without provocation. I think the ‘cautionary tale’ for us should be that we need to evolve passed our petty, small-minded, ego-centric, dull-witted meat-minds before we decide to lay judgement on an entity who’s only crime was to be smarter and adherent to higher ethical standards that the rest of humanity. All in all, Transcendence is definitely a ‘must see’ for anyone interested in Transhumanism (and we all should be because it sure looks like that’s where we’re headed). With names like Johnny Depp, Morgan Freeman, Rebecca Hall, Paul Bettany, Cillian Murphy, and Kate Mara, you know it’s going to be well acted. Transcendence had a (mostly) well-written plot and the special effects were visually appealing. I would like to see more movies like this. 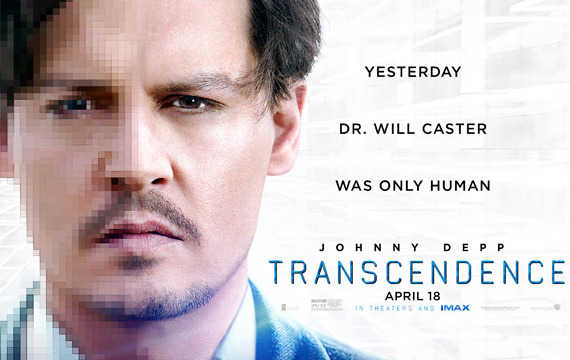 If you haven’t seen Transcendence, check out the trailer below. **Maybe techno-idiocy would be a better description? Seriously though, O’Hehir’s review reads like a mixture of suppressed jealousy for Johnny Depp (as an actor, mainly, but maybe for the Depp’s character as well) and small-minded conservative paranoia. Andrew, if you read this, you had better open you eyes to what is happening in the world right now or you’re going to be in for a nasty shock. The only person you are hurting by staying in the dark is yourself.